404 Error page is displayed when a user wants to enter a subpage of your website which doesn't exist. By default, the user will see information about the error and link to a home page of your website. In web design software WebWave CMS you can easily edit 404 error page and make it look unique and outstanding. How to create my own 404 error page? How to edit a 404 error page? What should I write on 404 error page? 404 error means that a subpage hasn't been found. This code is being returned by the server when requested subpage cannot be found. It usually happens when a user enters an incorrect site address or saved a link to a subpage, but it changed. More about 404 error read on Wikipedia. 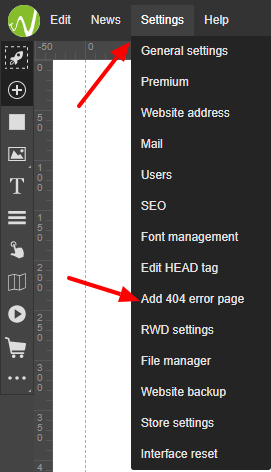 404 error page can be created in WebWave by selecting "Settings" at the top of the builder and "Add 404 error page". You can edit 404 error page just like any other page in WebWave. Use one of many templates, add new elements and content. There are no limits when it comes to editing your 404 error page. On 404 error page display clear and simple information what happened and redirect the user to home page. It increases chances of him taking time to stay on your website, rather than searching elsewhere. It is a good practice to make 404 error page with the same graphics as other subpages of your website. Take a look at some very cool 404 error pages here.